Basset Hounds are considered to be the world's no. 2 scent hound. 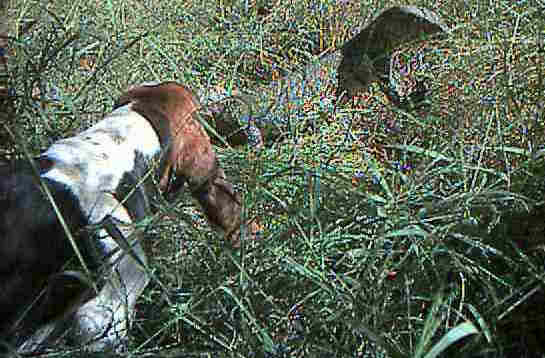 They are second only to the bloodhound when it comes to following the tracks of another animal. The average size of a litter of basset hound puppies is 7. 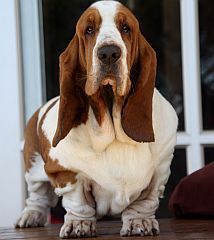 Most basset hound breeders in South Africa follow the KUSA standard, and frown upon the concept of miniature basset hounds. The Basset Hound is one of the most ancient breeds. It has survived plagues, famines, and wars. See origins of dogs. St Hubert, who lived on the French/Belgian border in the 7th Century, is thought to be the first person to breed a dog which looked something like a Basset Hound. According to church records, Hubert kept dogs with long ears, long bodies and short legs. It's possible that the breed goes even farther back, but few people could write in those days, so records are scarce. Clergymen could read and write, but the printing press had not been invented, so no dog books existed. Church records were written by hand. Hubert was of noble birth, the son of Le Duc de Guiennne. He lived from 676 to 727 AD. He had everything he wanted - money, possessions, a fine home. He lived a life of self-centered pleasure. For sport, he took up hunting and became very good at finding herds of deer in the dense Ardennes Forest. Once during the Easter Holidays, he organised an outing to the forest with a few friends - perhaps a few damsels to spread the picnic tablecloth, maybe a flagon or two of French wine... Leaving his friends to prepare the fire, Hubert set off to catch the game for the party. This was going to be his lucky day when he found that herd of deer he had been searching for! Hubert trudged deep into the gloomy forest following spoor, but found no animals. Tired, frustrated, hungry and irritable, he knelt down to drink water from a pool. He became aware of a moving reflection on the calm water. Looking up he was confronted with a majestic deer that had come to the pool to drink. Slowly Hubert placed an arrow in his bow and took aim. The Spring sunlight filtering through the trees seemed to make the shape of a cross between the antlers of this beautiful animal, almost dazzling Hubert. Hubert drew back the bowstring, but the cross seemed to shine on him. There in the silence of the forest, Hubert felt God was speaking to him. He remembered it was Good Friday, one of the holiest days in the Christian calendar. It was the anniversary of the day when God had shown his love for the world by sending his only son to die for mankind. Hubert reflected on his godless lifestyle and there on his knees he prayed, "God forgive me for I am a sinner. No longer will I live for myself, but for you." On his return home, he sought out a church-goer and started attending church. He had a growing conviction that he would find more fulfillment from life if he dedicated his life full-time to God. So he gave up his position of privilege as the son of a Duke, and joined a humble monastery where he could study the Bible. All the monks of the monastery had dedicated their lives to God. They probably spent their days copying out pages of the Bible by hand. If anyone made a mistake, he had to re-write the page. (How we take this book for granted today! ) The monks also kept journals, from whence come our dog records. It was the men's desire to spend their time in prayer, worship, and doing good, but they often spent their time running around chasing boar, or rabbits for their rabbit pie. There were no guns to shoot animals. It was hard to put God's work first if half the day had to be spent hunting for food. There was no supermarket. Hubert's hunting expertise was no doubt very welcome in the monastery. Hubert became a Bishop and had a say in the running of the abbey. Being a dog-lover, he gave a home to all sorts of dogs - big and small. They were loosely called, "Hubert's hounds." Hubert noticed that certain dogs were good at tracking game, and they mated and produced a litter of good hunters. By in-breeding (mating say brother to sister) the next generation became even better hunters. After Hubert's death , he was proclaimed the patron saint of hunters. No one is born a saint. We can choose to live saintly lives. We now refer to his dogs as "SAINT Hubert's Hounds." About 1000 years later, they became known as Basset Hounds. The French word for "low" is "bas." The dog is low to the ground. "Basset" has now come to mean "short-legged." 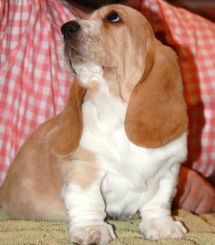 Basset Hounds were taken to England where the breed was developed further. "My hounds are bred out of the Spartan kind; So flew'd, so sanded; their heads are hung with ears that sweep away the morning dew..."
Basset Hounds are sturdy dogs who make good pets. They love to go for walks and use their great sense of smell to follow the trails of other animals. A Basset Hound is a scent hound. A good strong fence is necessary or the Basset Hound will go searching for trails to follow. They are bigger than most folk realise, and need a big yard. Basset Hounds have a loud bark which could annoy neighbours if houses are close together. Training is essential. The short, smooth coat needs no grooming. Colour: black, white & brown or any combination of these colours, also lemon (beige) and white. The markings are of no importance.